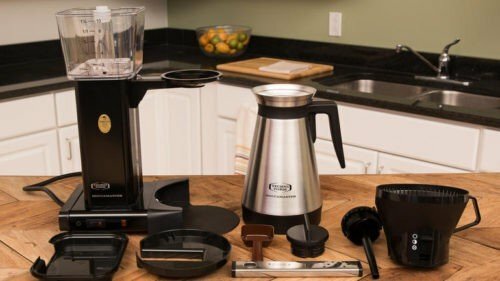 The first question that strikes many minds on hearing about Technivorm Moccamaster is, “Why does it costs so much?” It’s true that you can get an auto-drip coffee machine for next to nothing, and for many people that may be good deal. However, coffee connoisseurs have been happily buying Technivorm’s coffee makers for several decades now and saying that they’re worth every penny. 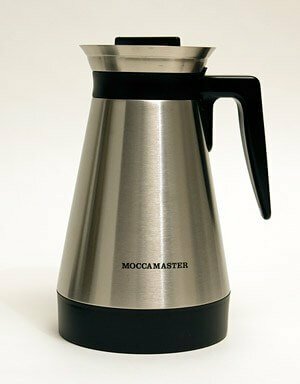 The answer to Moccamaster’s enduring appeal isn’t that it has a lot of special features. There are only two controls on this machine: the on/off switch and the manual slider on the brew basket to adjust the drip rate. The KBT-741 won’t tell you the time, make your coffee before you wake up, or even brew you an espresso. It’s an auto-drip coffee machine review, plain and simple. Don’t expect much functionality here as this machine is simply targeted to give you the best coffee every time and you are simply going to forget about all the other brewers. Moccamaster’s are hand built in Netherlands and are specifically tested for the heat, speed and quality of the product meets their standard guidelines and the very strict requirements of both the Specialty Coffee Association of America (SCAA) and the Specialty Coffee Association of Europe (SCAE) for coffee brewing quality. 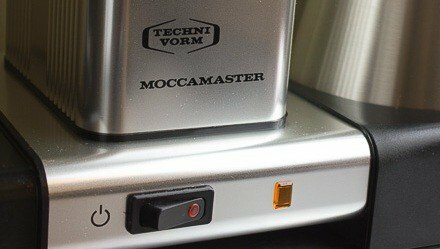 The Technivorm Moccamaster is designed to do just one thing – brew a pot of auto-drip coffee – and to do it as well and as reliably as possible. If you’re looking for a coffee machine with lots of bells and whistles, this is not that machine. Instead, the brewer focuses on build quality and optimal performance. The copper boiler heats water to the optimal brewing temperature of 196 to 205 degrees Fahrenheit every single time. It only takes 4-6 minutes to brew a full pot. So the lack of a programmable timer shouldn’t slow you down too much in the morning. Remember that pre-programmed brewing requires you to leave your ground coffee to go stale in the filter overnight. This probably isn’t something you want to do if you’ve just spent hundreds of dollars on a coffee machine that optimizes the brewing process. The brew basket of Technivorm Moccamaster features a manual slider control that allows you to choose full drip, half drip or no drip. The no-drip setting allows you to sneak a cup of coffee before the whole pot is ready, while the half-drip setting is designed to improve extraction when brewing smaller amounts of coffee. If you want to use these settings to pre-infuse your coffee, set the control to no-drip and begin brewing. After the grounds are wet, wait 30 seconds and then set the control to half-drip or full-drip. Just don’t walk away from the machine during this time, or you may end up with a giant mess on your countertop. 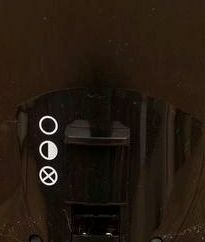 Some people prefer to use the half-drip setting even when brewing a full pot of coffee. This can be especially helpful if you are using a coarser grind of coffee. Fine grinds work better if you brew more rapidly at the full-drip setting. The KBT-741 comes with a thermal carafe that should keep your coffee hot for a couple of hours. Whether you prefer a model with a thermal or a glass carafe is a matter of personal choice. While a glass pot with a heating element may keep your coffee hotter, it can also give the coffee a scorched taste if you leave it for too long. A thermal carafe preserves the flavor of freshly-brewed coffee, but may not keep it at a just-brewed temperature for very long. To get the best results, pre-warm the thermal carafe with hot tap water. Also notice that it uses a brew-through cover that keeps the coffee hot during the brew cycle and funnels it directly to the bottom of the pot. To keep the coffee hot after brewing, remove the brew-through cover and use the regular cover instead and be sure to tighten it properly. This and all Technivorm models are handmade in the Netherlands using high-quality parts and materials. As well as being certified by the Specialty Coffee Associations of both Europe and America (SCA & SCAE), the Moccamaster meets the gold cup quality guidelines of the European Coffee Brewing Center. These machines will cost you a lot of money up-front, but they are made to last for many years. In our current age of cheap, semi-disposable consumer goods, we tend to view auto-drip machines as something we replace every few years when they wear out. It’s cheaper in many cases to toss the old machine and buy a new one than it is to repair it when something goes wrong. Moccamaster, on the other hand, thinks that a coffee machine is something you should only have to buy once. If you descale it every few months, the guts of the machine should last for many years. Though you may have to replace the occasional plastic part such as a filter basket. The KBT-741 is under warranty for 5 years. Also the repairs are done at a nominal fee once the warranty has expired. This machine could end up saving you money in the long run, and it’s less likely to end up in a landfill site. This model hasn’t changed its look all that much since the 70s, when space travel was all the rage. At a glance, it looks a bit as if the machine was designed to launch the cone-shaped carafe into orbit. These days this style has a decidedly retro feel, which may or may not work well in your kitchen. You also need a bit of space in your kitchen for this machine. It’s 15 inches tall and you need to pour water into the tank from above. It’s about 11 inches wide and little more than 6 inches in depth, so it has pretty large footprint on your counter. However, its “two tower” design looks a bit more light and airy than some of the more blocky designs you see with other machines. The most obvious disadvantage of this model is its price tag. Three hundred dollars is more than people willing or able to pay for a drip coffee maker with no special features. The KGT-741 is not the right choice if you can’t taste whether or not coffee has been brewed at the right temperature, or if you’re just looking for some caffeine to wake you up in the morning. However, if you are a coffee connoisseur with enough money in your budget to pay for one of these machines, you most likely will not regret your investment. Customers have had differing experiences with the thermal carafe. Some say that it keeps the coffee hot for hours, while others complain that it gets cold almost immediately. One possible explanation is that not everyone preheats the pot with hot water. Also some people may not remove the brew-through lid right away. Some people have also complained that the seal doesn’t work that well on the filter basket when it is set to no-drip. The culprit here seems to be stray grounds getting into the filter basket. If you’re very careful to keep this area clean and free of grounds, you should have no problem. Most purchasers understand what it is they’re paying for with this machine, and are very happy with the results. If you’re looking for a durable and attractive machine that makes perfect coffee, the Technivorm Moccamaster is a great choice. It’s also worth looking into some of the other models in this line. The KBG-741 is a similar model that comes with a glass carafe and heating element. (We have our opinion about KBG-741 in our list of Pink Coffee Makers). In order to avoid scorching, the element is adjustable to a lower setting and features an automatic 2-hour shutoff. This model is also available in a beautiful metallic red finish. 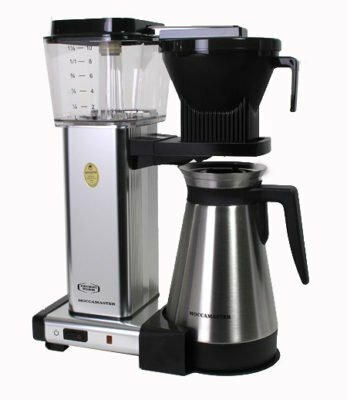 If you’re looking for a smaller model with a thermal carafe, the KBTS is a good option. It is a couple of inches shorter and brews a liter of coffee. No machine can be all things to all people.